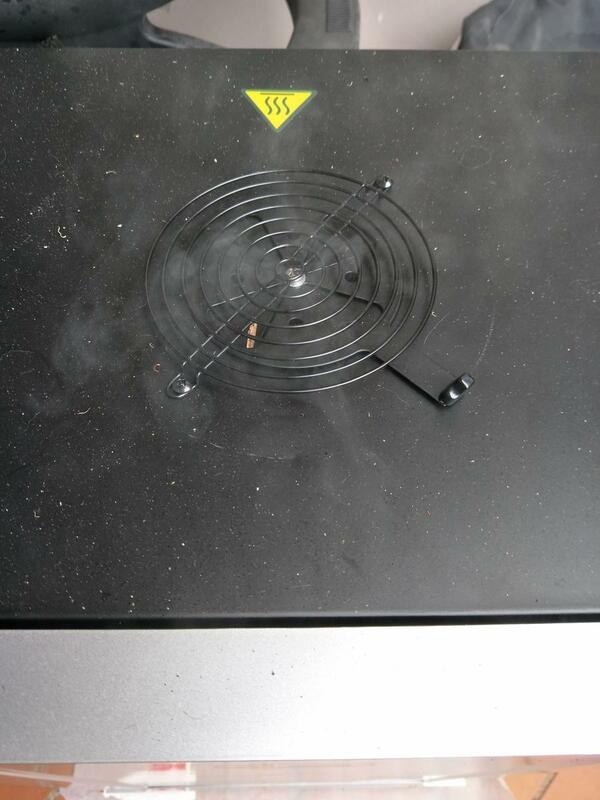 We love this thing, but using it has many caveats associated with smoker cooking in general. So don't buy it if you can't use it. Once you’ve had good pulled pork from a BBQ smoker you tend not to forget it. 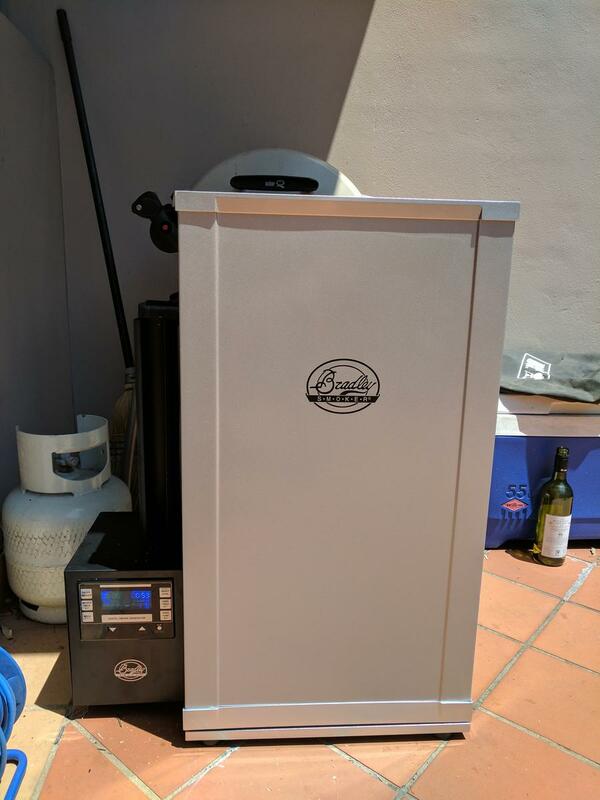 So when Bradley sent over one of its new Digital Smokers that was top of our list. The device comes in two parts – a large cabinet with an oven element at the bottom plus a digital controller which pushes wood bisquettes into the oven and heats them up. This is the smaller 4-rack Bradley Smoker. There's a larger 6-rack version too. They are not small. The digital controller controls the time and temperature of the oven – leaving it on for 12 hours at low temperatures is very simple. It also controls the time that the smoker operates and uses a conveyor system to keep fresh wood bricks flowing. You can add multiple bricks to a hopper tube at the top. 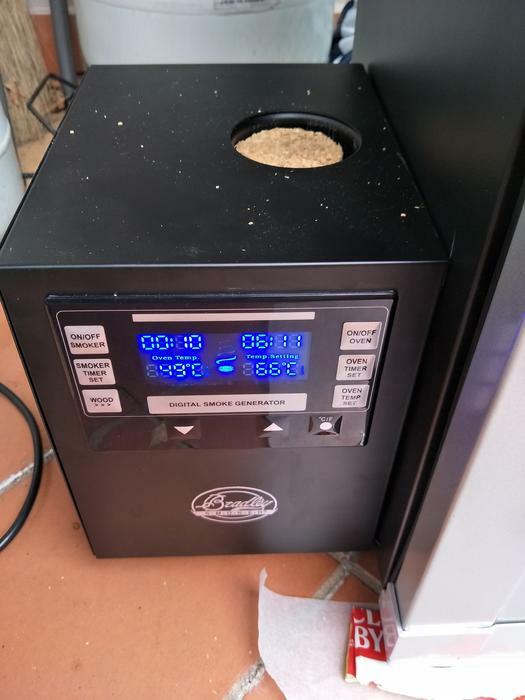 The digital smoker ignites the one at the end – or at least heats it to the point where it burns and smokes without actually catching fire – and then pushes the burnt pellet into a bowl of water at the bottom of the oven by pushing a fresh pellet into its place. This cycling through wood bisquettes means that ash doesn’t become a problem and that the smoke produced doesn’t become too acrid or acidic - it stays, er, fresh. The digital controller sets the temperature and timing of the oven and the smoker. Wood-chip bisquettes are automatically fed in from the top with a large hopper included to allow a long steady flow of fresh wood. 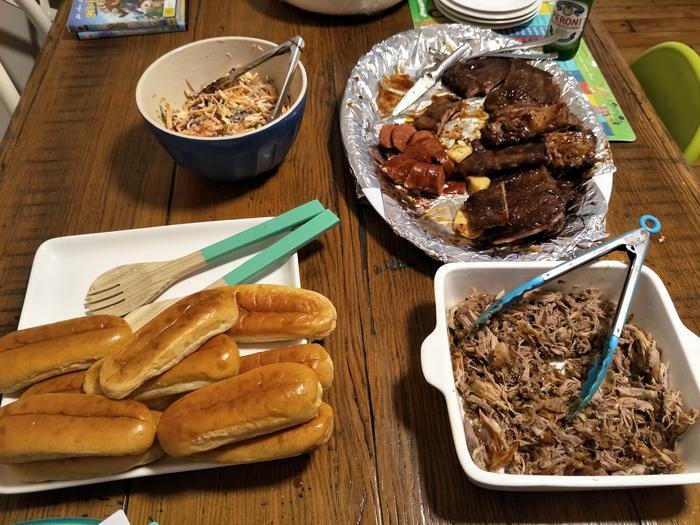 If you want you can even cold smoke food by leaving the oven off and the smoker on which means you can add flavor to meat and cheese without cooking it. You can also cure your own fish and other meats. The latter however comes with a warning in that if you don’t know what you’re doing you run the risk of severe food poisoning. So we stuck with hot-smoke cooking. We set everything up relatively quickly. It’s big and heavy but well-designed and intuitively laid out. To ‘cure’ the oven for its first use you’re told to set the temperature to 66oC and leave it smoking for an hour. This is where our first problem began. We live in a suburban town house in Sydney with neighbours in close proximity on every side. The amount of smoke produced during this process was akin to a small bonfire. It won’t just be the oven that is fuming if neighbouring windows are open or the washing is out when doing this, you’ll likely have the council round too. A great deal of smoke can emit from the top, even with the vent closed. Your neighbours may hate you. This made us incredibly nervous when actually using the cooker, which we did on Australia day. Fortunately, when food is in the oven, the amount of smoke lessened. A bit. 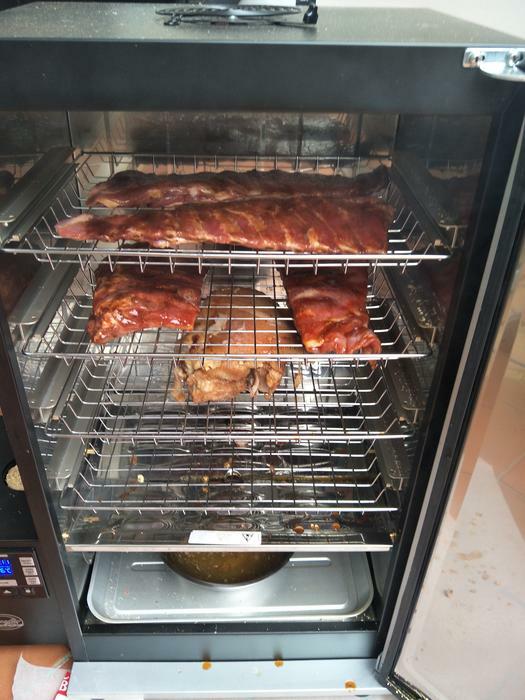 It helped that our neighbours were out but we had planned to talk to them first and offer to smoke something on their behalf – it’s a big unit with four racks and plenty of room at the end of the day. While it’s nice to think about smoking a pork shoulder for 18 hours solid, in reality you only really need to smoke it for the first and last hours. It’s also worth noting that while the temperature on the digital controller looks precise, the cavernous, unsealed (there’s an opening at the top) nature of the oven means that temperature will be higher at the bottom of the oven, close to the heating element. As such high wind can affect and reduce cooking temperature because of this. 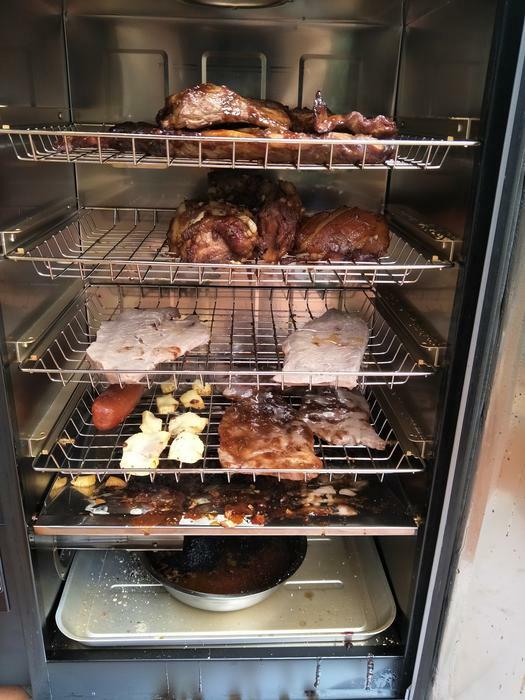 We found that the smokers ignition increased the oven temperature to above what we set it at but that everything eventually settled down to match what our desired temperature after ten minutes or so. Bradley still stresses that a dedicated meat thermometer is the best bet for an accurate reading because of the inherent inaccuracy of the internal cooking system. At the end of the day, if you’re cooking stuff for hours on very low settings, this isn’t a huge issue for many meals, though. Pulled Pork Shoulder – we left this slow clooking overnight submerged in Cider Vinegar because we couldn’t face leaving it on outside all night because of the neighbours. 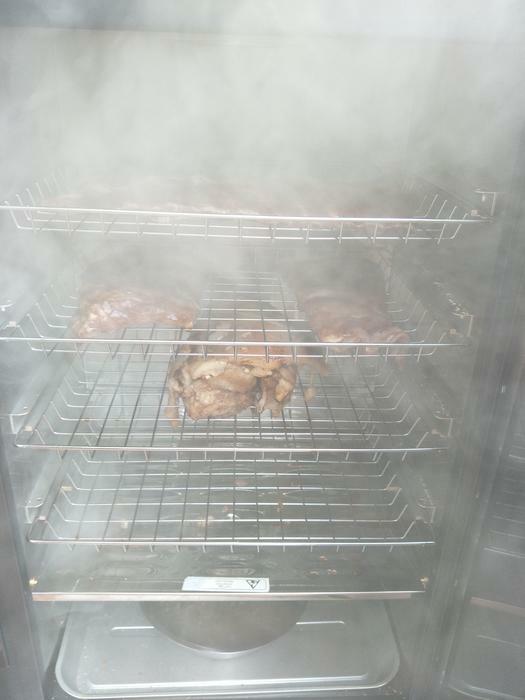 In the morning we transferred it to the smoker and left it for 10 hours at 66oC with an hour of smoke at each end. It was absolutely stunning and enhanced even further when served with some North Carolina style vinegar sauce. Everyone loved this. It quickly became one of everybody’s favourite foods. Pork ribs and shoulder hit the oven. Note the water bowl at the bottom. Pork Ribs – We left these smoking for ten hours in a chili-rich BBQ sauce but frankly the results were disappointing. The thinner ribs turned into jerky while the thicker, succulent areas were cooked but not falling off the bone. We’d need a lot of experimentation to get this right. Next time we’d like to try thicker beef ribs and cook them for longer. Thin beef steak – with Australia Day happening we suddenly feared that we had not got enough food. We got some thin-cut steaks and added it in for the last hour (in the smoke). To be frank they came out looking somewhat grey, unappetising and not fully cooked. However, finishing them off on a very hot barbecue grill for a minute left us with some amazingly-flavoured succulent steak that everyone loved. Some of the steaks had been smeared in the pork rib sauce and this worked really well. We were big fans of this dish. Everything coming up gorgeous. Except the grey-looking steaks. These needed a quick searing on the grill. Then they were perfect. When up and running there's a LOT of smoke in there. Chorizo sausage – We’ll forever lament the lack of proper Chorizo in Australia (you can’t import raw food that hasn’t been nuked for unfriendly bacteria unfortunately) but there are some decent Aussie versions if you know where to look. We deeply-scored half of a thick sausage to let the smoke and low heat penetrate the middle. What a revelation. The fat had melted away and the smokey Chorizo just melted in the mouth. Amazing stuff. All sausages work well in smokers we're told. Brioche buns, smoked pulled pork shoulder and slaw and OMG. Haloumi cheese – Another experiment. We added some small strips of Halloumi (the BBQ friendly cheese) to the grill and while it came out looking a bit brown/grey and unappetising, OMG did it taste good.